A team of advanced carpentry students under the direction of teachers from the North Bennet Street School is making steady progress in its painstaking effort to restore the top two sections of the First Parish Church steeple. The historic church’s tower was removed in 2006 amid fears that it could collapse after years of water and wind damage— and deferred maintenance. Now, the reworked and rebuilt steeple sections are finally nearing completion— one part of an ambitious $5 million restoration job that will restore the colonial revival landmark to its original glory atop Meetinghouse Hill. 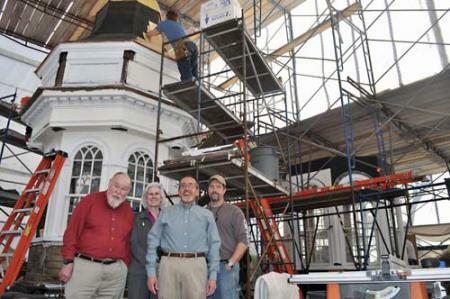 The “fly date” for hoisting the two-piece steeple back onto its 150-foot perch is tentatively set for May 18. The Saturday event will be timed to avoid any disruption to students or faculty at the adjacent Mather School. A large crane will be needed to hoist the rebuilt lantern sections into place— a job that will likely be an all-day affair. Church leaders plan to celebrate the successful reunion of church and steeple at a later date. Working under the careful eye of project manager and teacher Rich Friberg, the 11 students in the North Bennet Street School’s preservation carpentry class are working furiously to finish the job on time and before their own graduation later next month. Friberg spoke to the Reporter inside a makeshift workshop that has been built around the steeple structures on a vacant lot next to the church. Such careful craftsmanship is easier to execute on solid ground— a luxury that the original church builders were not afforded, Friberg said. There was no crane available to hoist large sections to the heavens, so the turn-of-the-century carpenters literally built their way to the top, using ropes, hammers, and nerves of steel. The second-year students, who worked to repair the church’s windows last year, will be getting help from union members from the Sheet Metal Workers Local 17, who will be brought in to install copper finishes and flashing to help weatherproof the steeple. The lower section of the lantern was in the worst condition and had to be almost entirely rebuilt. The biggest challenge to date was figuring out what pieces belonged to each section, as parts of the wedding-cake style structure were cut off during the 2006 removal process. Elements of the restoration job were done in an Arlington studio owned by the school. An ornate pineapple-shaped molding that is part of the steeple’s weathervane had to be reproduced using the 210-pound original faux fruit— too badly damaged to be saved—as a model. “We used eastern white pine in all the materials, which was what the original church is made from. For the most part, it’s exactly how it was originally built,” said Friberg. Rev. Art Lavoie, the minister at First Parish Church who has led the effort to restore the church and the superstructure, said that visitors frequently come by to see how the work is progressing. The students, Lavoie says, have taken real ownership in making sure that the steeple restoration gets finished before their graduation in late May. “Their commitment and their excitement about this project has been extraordinary,” said Lavoie. The existing First Parish Church is actually the sixth home for the congregation that has its roots in the first days of Dorchester’s settlement by the Puritans in 1630. The modern church structure was built in 1897 after the fifth church was destroyed by a fire. The congregation opted to keep a wooden, classic white clapboard look based on a design by Christopher Wren and executed by the architectural firm Cabot, Everett and Meade. Decades of little-or-no maintenance took their toll and forced the current leadership of First Parish to confront its condition or face an existential crisis. The $5 million project— financed in part by the sale of the church’s own colonial silver collection at a Sotheby’s auction last year—is happening over several stages. Major repairs have already been completed to the interior of the church, window sashes, and the roof. Contractors from Murphy Specialists are now at work replacing damaged clapboard and preparing the church for a major paint job later this summer. Much of the structure is now surrounded by scaffolding — some of which will be taken down in time for the anticipated May 18 steeple lift-off.